I have expected this North American weak cold blitz to occur a bit earlier this December, quite normal given the low sun elevations in the Northern Hemisphere. So far, Siberia has some close temperature anomaly semblances with December 2005. The warmer winter to date automatically has given momentum making EH2r winter projection to be correct at the beginning of winter! Not expecting heat to be spread out equally, there surely will be a cold zone, Eastern Russia seems to be it once again. When sun elevations exceed 30 degrees in your location the warmer air already lingering in the atmosphere will blitz winter cold back Northwards ferociously. Ice extent has been remarkably weak, this gives another surprise, Arctic Ocean being more open does not give more snow, the contrary is happening everywhere, even in the Arctic, this is bad news for all NH Glaciers vitally needing replenishment. The idea of an open Arctic Ocean, at this rate, coming soon, giving more snow and triggering an ice age, seems to be a bad theory. What more open water does, is increase water vapour content in the atmosphere, without a vital condensation ingredient which usually happens in the spring (requiring strong photo chemistry amongst other factors). It already is if you consider the year from December 05 to November 06. Tied for second place with 2002, beating 1998 by .03 C, preceding last year by a mere 0.1 degrees Celcius. If December keeps up as it is it will definitely be the 2nd warmest. A bit of a surprise, since November 2006 Northern Hemisphere temperature anomalies closely ressembled November 2005, a sure sign of a repitition of last winter, however with retrospect, October 2006 surged way warmer, along with unprecedented sun compressions, this was a sure signal of this current NH warm December. Since temperature anomaly patterns seem to be repeating themselves, it seems obvious that a milder than December 05 precedes a milder warmer winter for January to March 2007. European Alps without snow is par to the course, North America had some locations with strong cooling as expected. Siberia, being likewize to North America, has shown strong signs of cooling as well. However, if winter of 2005 repeats itself, as it seems, North America, will warm up after a cold spell, Central Russia will be very cold, Eastern Europe should experience some of that cooling. While Western Europe should experience a mixture of greater warmth than 2005 with cold spells only at times. Like North America, Fall like winter, with days having a reminder of winters past occuting sporadically. I noticed having said it to others , but failed to write it formally and completely on this website a few weeks ago. Winter final projection, eerily similar to 2005, with cold December, yet a much warmer rest of winter. Sort of winter at times, and fall like weather at most times for most of North America. I gave up on being very precise on Russia given the lack of data coming from that country, but would expect a similar earlier cooling perhaps persisting longer than at other NH locations. Winter of 2006-2007 will be very mild, likely exceeding the meam NH temperatures of 2005-06. There was a strange assymetry of cold and warm spots throughout the Northern Hemisphere. Overall warm won over, to a whopping +1.18 C, the warmest October in history. The cold spots formed similar to last year. I think that there is some air circulation connection between North American Polar region and the Russian one. Patterns are eerily similar to 2005 at the same month. This makes it a bit easier to foretell a projection. ENSO is the only major change which seems to give warmer temperatures where it rages. I have not seen ENSO significantly affecting other regions of the world. There is however a precedent, the winter of 1998-99 was amazingly warm, but they were not influenced by as much open Arctic Ocean water. I found the entire warming of October 2006 fascinating, unexpected from September data, surely expected by early October expansions. Mechanisms making October swallowing the whole North American Arctic with much higher temperatures is the stuff of multiple studies. Sun discs in September, were in parity with September 05. What makes the atmosphere so much warmer than 2005 when the sun is going down fast? It was highly likely, by default, that there was simply a warmer atmosphere which had too much moisture and heat to start with. Unreal as it seemed, fall 2005 expansions were throunced today, it would have been impossible to distinguish a Montreal summer shot with today's captures. Surreal warming throughout the Arctic having surface temperatures 10 to 15 degrees C above average, not for a day but for more than a week has amazed all who live here. Clouds dominated of course, no observations were done until today, half a dozen observations have showed huge expansions, easily beating ever so impressive 2005. The running average temperature of the last ten late october days in Resolute has about equalled the average temperature for last September. This heat event was captured more than 2 weeks ago. It was at first a huge Low cyclone coming from the Pacific, but this Low did not last as long as the heat. Our Arctic's quite unusual warming can't be explained by any other way, the atmosphere as a whole is warmer, mainly from: more open ice free sea water , advection from the Pacific and Atlantic, a huge cloud coverage, and finally from a warmer atmosphere to start with. The Upper Air is thus, despite the ever descending sun, a source of heat radiation synergized with the sea. This makes it very nearly certain that the coming winter will be like autumn for most North American locations, Russia/Eastern Europe is the big question, but ENSO dynamics reconfigure meso scale circulations. There you have it; winter seasonal projection is nearly done, I am still mulling over at possible scenarios for Russia. Look for a complete projection at the onset of the long night on November 6. Septemner Nothern Hemisphere results are in, exactly like predicted from Montreal. There were many intriguing features, Russia did warm up as expected from last Springs projection, however North America somewhat cooled a little bit. That is the surprise which knocked off September as being #1 warmest. A complete study for this slight surface air cooling is needed, but it is largely superficial, as some current diffrential refraction shots were found expanded way above normal. True enough to form, these expansions preceded a significant warming in the High Arctic with temperatures +12 C above normal. Despite pressure heights apparently more or less normal. Suggesting a strange Upper Air configuration. Overall its warmer, and there is no sign of significant cooling, so far to date, if this keeps up, it will be the warmest winter ever again. An early indication of the coming winter shows strong signs of equality with September 2005 (40 observations). First question to mend is whether this means an end to the strong push of warming seen during the entire 2005 seasons. The answer is no, what remains to be determined is the cooling rate from this present heat state, this will be determined in October and very early November. But it begs to remind a stall nevertheless, a slower rate of warming then found with the 2005 jump. It seems plausible that this stall is from the solar activity minima, once all published, many sun disk pictures on the differential refraction page are without any sun spots. The difference in heat should be quite small, but enough to nullify the warming trend upwards, which will skyrocket at the resumption of greater solar activity. In the context of why these differential refraction measurements matter, it is in the particular nature of air that it mixes quite freely everywhere, it is in these mixings, a continuous heat equilibrium is being sought or attained, not always wildly changing, but slowly with sun disks giving the trend away. Early projection for early winter: same of 2005, just as warm, and perhaps with identical mesoscale weather patterns. Long awaited NASA correction showed up, making May 2006 2nd warmest in history for the Northern Hemisphere. Nunavut area weather data was not included, adding its data boosted the NH temperature ranking. Also June 2006 warmest in Global temperature history for the Northern Hemisphere beating 2005. The Russian winter cold spot has now disappeared, in its wake a significant warming has occurred at exactly the same location. This will make it highly likely that summer of 2006 will exceed summer of 2005 as warmest in history, exactly as foretold below. Present Montreal summer of 2006 measurements were hampered by clouds and equipment failures, nevertheless, a significant number of observations show a dead heat between 2005-2006 differential refraction values, suggesting 2006 will edge over 2005 in vertical sun disk diameters. But first.. what is the big question? How fast is Global Warming happening? Thanks to various distortions, mainly flattening of sun disks, it is possible to calculate the true temperature of the atmosphere, as a whole, while never taking a single thermometer reading. Preliminary, not peer reviewed calculations have revealed a steady yearly increase in absolute temperatures by a substantial trend, at this time from Arctic observations alone. Unlike the global mean surface temperature, refraction calculated absolute temperature of the atmosphere takes into account the entire light path crossed by sun disk light waves. It gives a very accurate measurement providing adequate standardized instrumentation. The Global surface temperature is a great indicator of temperature trends though, however it is taken at various heights, over many land based stations, to complement this, the refraction calculation is a two dimensional result from a three dimensional interaction. More on this later when confidence in the calculations reaches the highest standard possible, including a presentation of the formulas and results. There are a few EH2r derived papers, this next one is in DUTCH , written by Siebren Van der Werf, to the William Barentz Institute, many of EH2r's best pictures are on this paper along with some surmising of the Barentz expedition sightings. Globally the summer of 2006 will be more than slightly warmer than the summer of 2005, however North America should be much warmer than the Northern Hemisphere average temperature. PANGNIRTUNG, Canada -- Thirty miles from the Arctic Circle, hunter Noah Metuq feels the Arctic changing. Its frozen grip is loosening; the people and animals who depend on its icy reign are experiencing a historic reshaping of their world. Fish and wildlife are following the retreating ice caps northward. Polar bears are losing the floes they need for hunting. Seals, unable to find stable ice, are hauling up on islands to give birth. Robins and barn owls and hornets, previously unknown so far north, are arriving in Arctic villages. Very cold winter came late in Resolute, very much as expected, but it did not last long, less than a week, ending yesterday. It was long enough to make key observations. establishing a baseline, of which I will measure the rate of sun disk expansion. A re-discovery was made, despite -40 C surface weather, cold SAT's do not cause incredible shrinking, a cold lower upper atmosphere does. When there is a weak surface inversion combined with surface air of -40 C along with a very warm lower atmosphere just above, sun compressions are not remarkable, but when there is a cold upper atmosphere with a significant steep inversion, huge compressions are achieved. An early expansion signal was detected, of which 2002-2006 differential refraction intercomparisons make 2006 37% more expanded than the previous 4 individualized seasons, a normal statistical result, admitting no change in vertical size, would be around 20%... That is not all, warmer sun disks are yet to be merged with elevation averages, it looks without a question that 2006 will be warmer than 2005. A more final projection will be made in 15 days. Resolute sunrise today 4 days before official estimate (february 5) , appeared as a line skimming the horizon consisting of Somerset Island (40 nautical miles South of observer). 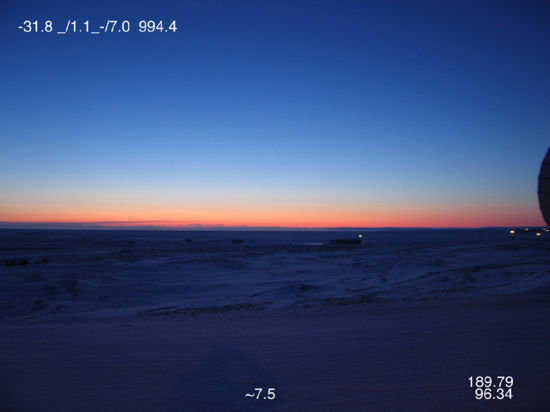 It appeared and disappeared many times before final sunset somewhat lower than -1.92 degrees. Predicting successfully this warm winter proves again another triumph for the oblate sun method. I give here a tentative preliminary explanation of what is going on with the help of the sunless horizon. First of all basic science was applied during my November 1 2005 projection, namely the principle of conservation of energy: "the total energy of an isolated system is constant"
In the case of Planet Earth, this rule indirectly applies given that radiation heat lost to space does not accelerate, higher temperatures do not cool down faster because the atmosphere starts from a warmer or higher energy level. The system is not isolated but heat is lost at a constant rate. Extraordinarily clear air for mid-January in Resolute, free from major Arctic Pollution sites, indicating smaller isolated air zones instead of consolidated mega trans-continental air masses which usually dominated most regions in the recent past. This is, to date, an on going Circumpolar event, which means most weather is totally off kilter in many NH locations. The major cause for this phenomenon is a lack of Cold air consolidation, in other words, the presence of warmer air is significantly weakening winters usual bitterly cold grasp over huge geographic regions. Not all winter forecasts were wrong, thanks to the Oblate sun method this warm winter was forseen November 1, 2005. Anyone cares for golf in Toronto at the coldest time of winter? Although there are the usual Northern Hemisphere cold zones, perhaps in the Moscow region at this time, this does not come from the Russian Arctic, experiencing temperatures 25 degrees C warmer than the Russian Capital. No sign of severe cooling expected by seasonal forecasts was perceived, Resolute being in the actual coldest zone in the High Arrctic region, had a record or near record warm November, and also very mild December, much warmer than December 2004. World wise, it seems that cold airmasses are struggling in their usual wintry expansion South. On December 15 we will find out the extent of how warm December 2005 was. Y-V Ulluq Q effects were frequent and several good examples captured as with the one shown just above. Go to the Y-V link to make your own comparisons.